The tenth in our series of blog posts written by BLF 2013 speakers/presenters/sponsors. Small nonprofits offer some of the most cost-effective solutions for addressing our society’s most critical issues. The passion, drive, and tenacity that fuel their work provide vital opportunities for resource-starved communities that struggle to leverage the resources they need to meet even the most basic of needs. In an era when philanthropy is constantly changing its priorities and the government shifts resources away from social services, small nonprofits are more critical than ever to the people and communities they serve. Since the board members of these organizations not only provide oversight and planning, but also execution, they deserve legitimate attention, tools, and support. The nonprofit sector largely comprises very small organizations with limited resources for staff, if any at all. Roughly 86 percent of all public charities earn annual revenues of $499,999 and less (National Center for Charitable Statistics, 2013). The majority of these organizations will likely always remain small, but will continue to provide meaningful programming to the individuals and communities they serve. When working boards cultivate a culture of learning, strategic planning, active engagement, and staff partnerships, they will be more prepared to manage either growth or crisis. The term “working board” is an informal term that has emerged to describe a governance setting where board members perform not only their fiduciary and strategic duties, but also partner with staff to fulfill management and technical functions. Despite the fact that the majority of nonprofits have a working board, the sector has paid little attention to how they operate. Few resources exist that help small nonprofit organizations understand how to manage the complicated array of roles their board members assume. 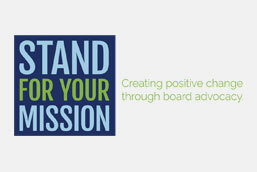 Organizations with working boards are often encouraged by literature and consultants to transition into a structure with clearer delineation between staff and board roles even though they may never achieve the needed sustainable revenue streams to successfully do so. Our perspective is that the working board is not a less sophisticated approach to governance structure. Rather, a working board requires a more thoughtfully constructed structure that relies upon diligent consistency in its implementation while maintaining entrepreneurial flexibility and responsiveness as the organization grows and/or adapts to its changing environment. Nonprofit organizations with small budgets are naturally complicated. They often have big visions and lots of passion, but lack the financial resources they need to achieve all that they set out to do. Yet, despite this key challenge, so many are still able to put forth programming that is meaningful, impactful, and, at times, lifesaving for the people and communities they serve. Faced with the challenge of accomplishing so much with so little, the board and staff members of these organizations naturally seek clear guidelines and strategies for how they can manage their resources in the most effective manner. At the BLF conference, in our session, “Making the Working Board Work,” we will explore this topic in depth by offering an official definition of the working board along with a model that can be used as a tool to help small nonprofits understand and manage the dynamic interplay between staff and board functions. We will tell the story of Kids’ Food Basket, a Michigan nonprofit organization that successfully grew from a $3,000 grassroots operation to a $4.1 million enterprise that now provides evening meals to roughly 5,500 food insecure children each weekday. This dynamic and lively session applies both theory and practice in an effort to provide a strategic framework specifically designed for the small nonprofit’s context. We will provide practical tools, thoughtful insights, and lessons learned that can be applied in most nonprofit settings, but are specifically geared to organizations with small budgets. Some of the specific tools and insights we will address include board/staff relationships, adaptive capacity, strategic decision-making, succession planning and transition preparation, committee management and more. The Kids’ Food Basket story will offer a real life context to these concepts. It demonstrates that when managed effectively, small nonprofits can prosper. What lessons has your working board learned?